Originally Written and Posted at Epinions.com on 11/26/04 w/ Additional Edits & Revisions. 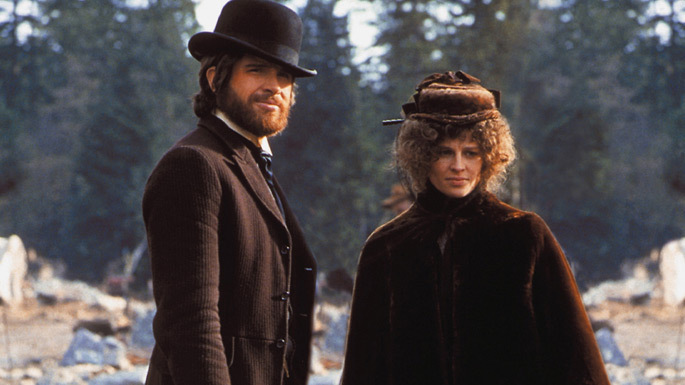 Based on the novel McCabe by Edward Naughton, McCabe & Mrs. Miller is the story about an entrepreneurial gambler who teams up with a brothel madam to become business partners for ventures in a town that is just developing in the late 1800s. Directed by Robert Altman and screenplay by Altman and Brian McKay, the film is a revisionist western set in the Pacific Northwest during the late 1800s where it explores ambition and the people that would come in to ruin the dreams of these two individuals. Starring Warren Beatty, Julie Christie, Shelley Duvall, Keith Carradine, Rene Auberjonois, William Devane, John Schuck, and Hugh Millais. McCabe & Mrs. Miller is an evocative yet entrancing film from Robert Altman. John McCabe (Warren Beatty) arrives on a horse to a small town where he stops at a saloon to gamble where he meets its own Sheehan (Rene Auberjonois) and a patron named Smalley (John Schuck). McCabe stays at the saloon where he reveals in wanting to build a new saloon and a gambling casino as well as a bathhouse. With Smalley and other men helping out, McCabe also bring in three homely women as prostitutes until a brothel madam named Constance Miller (Julie Christie) looks on as she meets with McCabe. Miller is aware that McCabe wants to create a brothel but felt the women he brought in aren't good enough as she can get more classier girls from Seattle where they make a deal for Miller to run the brothel while Miller also helps McCabe become successful. With the town being built as a group of people arrive including a barber named Washington (Rodney Gage) and a young woman named Ida Coyle (Shelley Duvall), the small town is finally completed where McCabe and Mrs. Miller's business ventures become successful. With Ida becoming a prostitute for Mrs. Miller after the death of her husband and the arrival of a young cowboy (Keith Carradine), a local mining business is interested in buying out McCabe as two men in Sears (Michael Murphy) and Hollander (Anthony Holland) offer McCabe a substantial deal. McCabe's decision upsets Miller who thinks that McCabe should've taken the deal but McCabe wants to stick to his dream of running a small independent business. After some discussions with Miller, McCabe starts to consider the offer as he turns to a lawyer (William Devane) who tells McCabe what he should do. Meanwhile, a gunman named Butler (Hugh Millais) arrives with two men whom McCabe believe are from the mining company. After an incident that leaves both McCabe and Mrs. Miller shaken, McCabe realizes what he must do to save his dream. While Miller & Mrs. McCabe, like many Westerns, have a shootout scene. Altman presents the scene in a more unconventional way, especially done in a hazy, snowy way where McCabe is battling Butler but at the same time, something else is going on in the town. Altman's directing style done in widescreen camera angles is very succinct and elegant in its look, notably for the fact that it doesn't look like any other Western. Thanks to a strong, ambiguous script by him and Brian McKay, the film is filled with many ideas and comparisons to the time of the late 1800s and the Vietnam-era of 1971. The film's business ideals and sense shows the idealism of the 1960s with many of the dialogue done in a more contemporary way with a lot of profanity. Yet, when the third act begins with death, it's not just McCabe's dream that falls but also something that many film critics had suggest that the death of an even bigger dream. This is why Altman's directing is so dead-on in its presentation, especially since he knew that big business would take over the little business soon, one way or another. Whereas most Westerns had a desert, sunny look, Altman chose for a bleak, rainy, snowy look in McCabe & Mrs. Miller where he shot the film, entirely in Canada. Helping Altman with his hazy vision is the grainy, desaturated cinematography of Vilmos Zsigmond, who brings a colorless look of muddy grounds, leaves, and everything else that isn't bright except for the sunlight in one scene. For the lighting, Zsigmond goes for candlelights in a lot of the interior scenes while in the exteriors, goes for graininess in its look. With production designer Leon Erickson and art directors Phillip E. Thomas and Albert J. Locatelli, the film has a very detailed look of the late 1800s Western saloons, bathhouses, and brothels, especially the bridges that connect in some of the lake areas. The film also has a strange, atmospheric sound with its wind and music box chimes that is captured wonderfully while Lou Lombardo's editing really helps give the film a nice pacing while in the shootout scene, help plays to the film's unconventional style. Then, there's the film's soundtrack which features three songs by Leonard Cohen, The Stranger Song, Sisters Of Mercy, and Winter Song which all came from Cohen's debut album. The use of Cohen's songs helps bring a dark, bleak atmosphere where everything is amiss and a sense of doom is set to emerge. Winter Song serves a nice accompaniment to the opium-induced mind of Mrs. Miller while The Stranger Song is perfect for the brooding McCabe. Sisters Of Mercy is also wonderfully used for the three homely prostitutes McCabe brings. Even in their extended instrumental sections that Cohen added to the film, it's melancholic folk-driven tone really gives the film a different feel in comparison to many Westerns. Then, there's the film's amazingly sprawling cast of actors. Hugh Millais is wonderfully sadistic and charismatic as Butler with his British, roguish tone where he seems like a likeable villain while Michael Murphy and Anthony Holland are sleazily brilliant in the respective roles of Sears and Hollander. Shelley Duvall is lovely as the aloof mail-order bride Ida who doesn't know much but her scenes with Christie are wonderfully executed. William Devane is exquisitely charismatic as McCabe's attorney who shares his dreams in a way that seems very off but with some humor. Rene Auberjonois is also wonderful in his small role of Sheehan as is John Schuck as McCabe's business associate, Smalley. Rodney Gage, Bert Remsen, and many other small characters are wonderfully acted but biggest standout in the smallest of roles is Keith Carradine as a doomed, young cowboy who gets killed for no reason since all he wanted was to get new socks inside the saloon. Warren Beatty, often seen as an iconic, handsomely old man, brings in an amazing performance as John McCabe. In his bearded look, Beatty brings a mix of humor, romanticism, idealistic, and charm to his role as the somewhat simpleton, chauvinistic McCabe. The scenes where Beatty talks to himself are funny sometimes but also sad since there's a sense of doom laying for him. Beatty really shines in this performance where he plays against type as a man who is just a bumbling, two-bit gambler who achieves something more than his simple, foolhardy dream. Julie Christie is the film's best performance, not to mention that she received an Oscar nod for Best Actress for this film, thanks to her Cockney British accent and smart, business tactics as Mrs. Constance Miller. Though the character was more interested in her opium pipe rather than the world around her, Christie brings grace and sympathy to her role, as a woman who is trying to ignore the world around her yet couldn't escape it. Christie also brings a sexiness that is a wonderful presence despite not showing a lot of skin as she transcends her beauty with grit and intelligence. Beatty and Christie are wonderful together in their scenes and thankfully, Altman chose for them to go more into a sense of business rather than into a full-on romance. Though, there's hint of it, Beatty and Christie chose to act like business partners rather than reluctant lovers. Though the two care about each other, they know what's important first. It's one of the best pairings in cinema. McCabe & Mrs. Miller is a magnificent film from Robert Altman that features incredible leading performances from Warren Beatty and Julie Christie in the title roles. Armed with a great supporting cast, Vilmos Zsigmond's lush cinematography, strong themes, and Leonard Cohen's seductive soundtrack. It's a film that is definitely among one of Altman's best films as well as one of the most unconventional westerns of that genre. In the end, McCabe & Mrs. Miller is a brilliant film from Robert Altman.